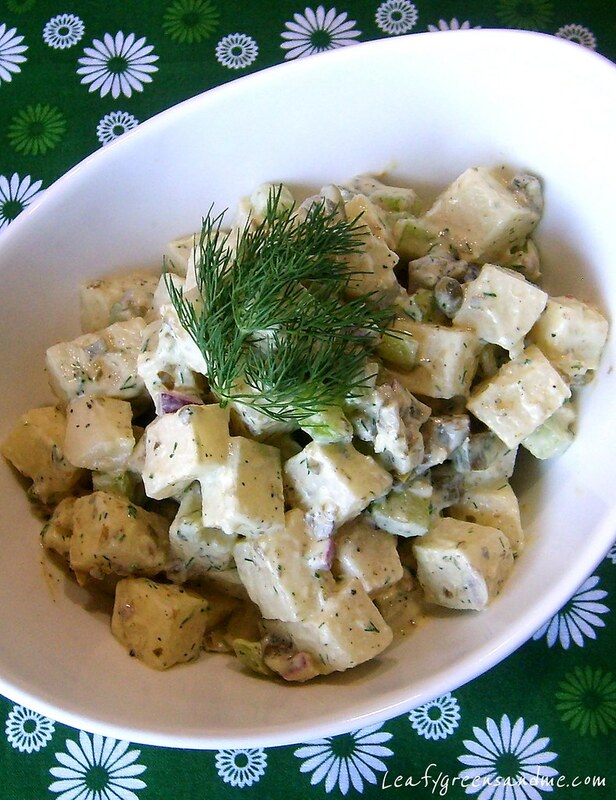 If you're looking for something a little different to serve at your BBQ this weekend, why not make a raw Jicama-Dill "Potato" Salad with Avocado-Dill Aioli. It's very refreshing served cold, almost like watermelon and has great texture. The avocado-aioli is also easy to make but takes a little bit of planning because you need to soak the raw cashews for at least four hours before blending. I served this with rosemary and garlic marinated slow-roasted, open-faced portobello sandwiches (no bread) with sliced heirloom tomatoes, bib lettuce and sliced avocado. Just delicious! Drain cashews and place in a food processor along with chopped avocado, mustard, capers, pickles and the juice of 1 lemon. Process until smooth scraping down the sides. With the motor running, slowly add water to desired consistency and drizzle in olive oil. Season with salt and pepper to taste and more lemon juice if desired. Chill for at least two hours for flavors to combine. In a large bowl, mix all ingredients together adding in enough avocado-aioli for a creamy texture and chill for about three hours for flavors to combine. Garnish with additional dill leaves and lemon wedges if desired. This was delicious! Even the old man liked it! Thank you!